Remember back in January when Trevor cooked dinner from a mystery basket? I loved watching him. Seeing him using a real knife and cooking on a real stove brought back so many memories of him as a toddler playing with his toy kitchen. He spent hours "cutting" fruits and vegetables, "cooking" food on his stove, and serving it all up on plastic plates. 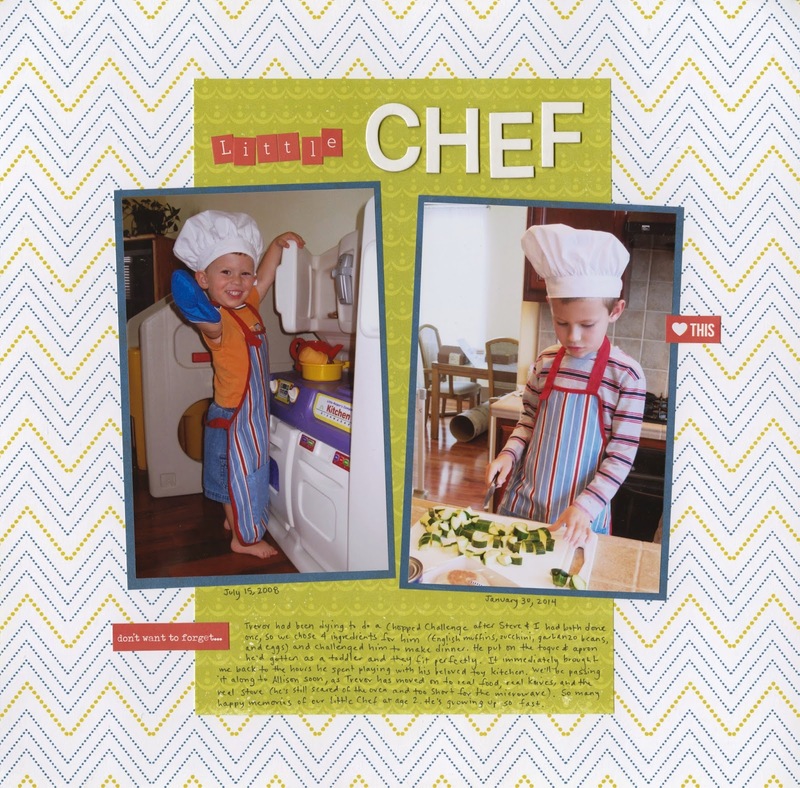 I found a photo of him when he was two wearing the same apron and toque that he wore for his Chopped Challenge and put them together to make this layout. Time flies when you're having fun! And being Trevor's mom is always fun. This is such an amazing layout, Cindy. So full of wonderful memories. I love that you had a photo of Trevor when he was 2 to compare to the recent one! And how much fun it must have been to have a chopped challenge in your very own kitchen!!!!! I love how he has progressed to a real chef now. You should be so proud! They grow so fast... ::sniff,sniff:: Cute layout! I love how he is all "fun and games" in the first picture and a "super, serious" chef in the second one!